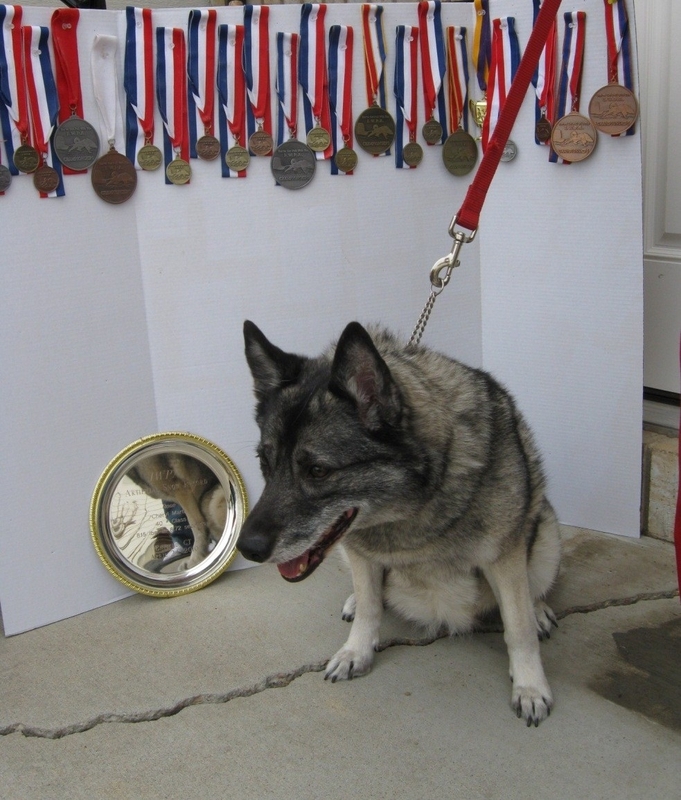 Rose is a Norwegian Elkhound, who pulled on both snow and wheels. The season of 2005-06, Rose's debut season, she earned a silver regional medal on snow and wheels. She was unable to compete at Championships in 2006, as she became the proud mother of 9 puppies in May. In the season of 2006-07, Rose was the regional gold medalist on snow, and the bronze regional medalist on wheels. At the 2007 Championships, Rose brought home a silver medal on snow, and a bronze medal on wheels. In the 2007-08 pulling season, Rose is the gold medalist on both wheels and snow. In the 2008-09, Rose is the gold medalist on snow. At the 2009 Championships, Rose brought home the silver medal on wheels. In the 2009-10 season, Rose was the regional gold medalist on wheels and snow. At the 2010 Championships, Rose not only earned a gold medal on snow, she pulled a record weight and is still the current record holder on artificial snow; pulling 815 pounds. In 2010-11, Rose was the double gold regional medalist. She earned a Gold medal on wheels at the 2011 Championships, and went to the 2012 Championships with a bronze medal on snow, and a silver medal on wheels. With a last great effort, Rose brought home double bronze medals from the 2012 Championships to cap off her retirement. Rose's best pull on wheels came in 2007, when she pulled 1,615 pounds at the New Plantation St. Patty's Day Pull, and her best snow is the 815 pounds which she pulled at the 2010 Championships.